A Fallacy is incorrect argument in logic and rhetoric which undermines an argument's logical validity or more generally an argument's logical soundness. There are many types of logical fallacies, and followings are examples of Logical Fallacies often seen in Arguments. It is very useful to focus in the issues and exposing their wrong at the same time. Remark: Not every liberal is guilty of all hypocrisies listed below, and conservatives can also be contradictory too. So please kindly do not attack me for not listing them here, but keep in your mind that I do acknowledge the opposites. 1. Ad Hominem - Attacking the individual instead of the argument. Ex: You don't use real name so what you say couldn't possibly be true. 2. Appeal to Force - Telling the hearer that something bad will happen to him/her if he/she does not accept the argument. 3. Appeal to Pity - Urging the hearer to accept the argument based upon an appeal to emotions, sympathy, etc. 4. Appeal to the Popular - Urging the hearer to accept a position because a majority of people hold to it. Ex: She was elected under democracy. 5. Appeal to Tradition - Trying to get someone to accept something because it has been done or believed for a long time. Ex: Democrat party did not win the election, so it is unacceptable that they formed government, never had done before in history. 6. Begging the Question - Assuming the thing to be true that you are trying to prove. It is circular. Ex: Democracy is the best ideology because it said so in many literatures. How can we trust those writings? Simple: I wrote them. 7. Cause and Effect - Assuming that the effect is related to a cause because the events occur together. Ex: In Western world where I worshiped, people seems to be happy. Therefore, democracy causes people to be happy. 9. Fallacy of Composition - Assuming that what is true of the part is true for the whole. Ex: You don't use your real name, so all what you have said must all be false. 10. Fallacy of Division - Assuming that what is true of the whole is true for the parts. Ex: Cambridge is one of the best university, and I went there, therefore I am also one of the best! 11. Fallacy of Equivocation - Using the same term in an argument in different places but the word has different meanings. Ex: A bird in the hand is worth two in the bush. Therefore, a bird is worth more than President Bush. 12. False Dilemma - Giving two choices when in actuality there could be more choices possible. Ex: I let you choose between Democracy or become Frog in a pond. 13. Generic Fallacy - Attempting to endorse or disqualify a claim because of the origin or irrelevant history of the claim. Ex. Coup was not elected to become government, therefore, they are not legitimate ruler. 14. Guilt by Association - Rejecting an argument or claim because the person proposing it likes someone whom is disliked by another. Ex. Dictator likes you, therefore you are bad. 15. Non Sequitur - Comments or information that do not logically follow from a premise or the conclusion. Ex. Economy isn't good, because there is no democracy. 16. Poisoning the Well - Presenting negative information about a person before he/she speaks so as to discredit the person's argument. Ex. Don't waste time listen to anyone who has bad manners (treated me bad). 17. Red Herring - Introducing a topic not related to the subject at hand. Ex. 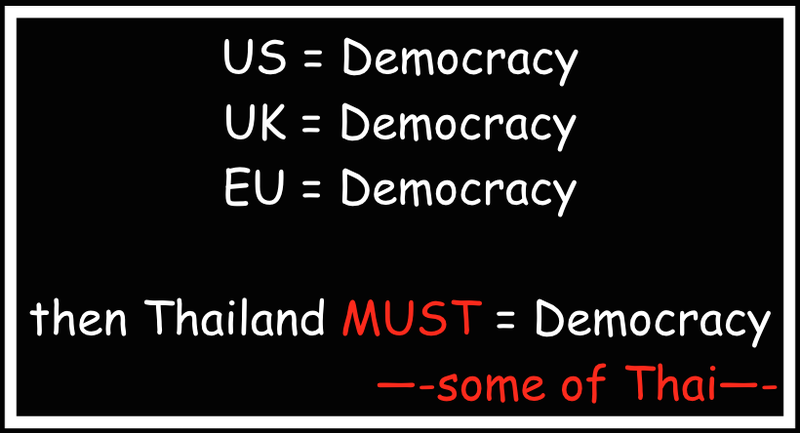 I know it is raining today, because there is no democracy in the country. 18. Special Pleading (double-standard) - Applying a standard to another that is different from a standard applied to oneself. Ex. I understand and accept those who used fake names to comment for their security reason (who agreed with me) but I will not tolerate those who used fake names disagreeing with me. 19. Straw Man Argument - Producing an argument about a weaker representation of the truth and attacking it. Ex. We know that evolution is false because we did not evolve from monkeys. 20. Category Mistake - Attributing a property to something that could not possibly have that property. Attributing facts of one kind are attributed to another kind. Attributing to one category that which can only be properly attributed to another. Ex. Democracy is the only way of life, I believed it, and you must also do, otherwise you are another frog in a pond. I hope those examples help somehow when making argument. Personal Notes: Fallacies found in Thai politics, from politicians, parties, and supporters, or even in news reporters. I felt that we need to fix this problem first before anything else can be done.